Hockey Fights Cancer in Youngstown! - Chad Veltri celebrates the win against the Gamblers on HFC night. Hockey Fights Cancer, it's one of those universal hockey themes. If you can't pump a crowd up with that, then do you even play hockey? 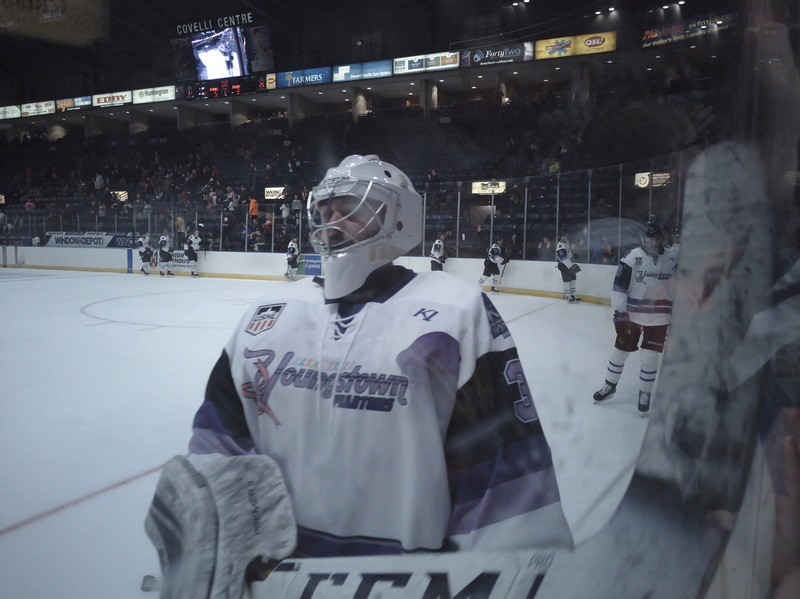 With over 2,400 in attendance last night for the Phantoms' HFC night, the Phantoms proved they could. The game started with a couple quick strikes for the Phantoms. Aresenii Smekhnov reversed the puck behind the Gamblers net. Craig Needham was able to pick it up when a Gamblers defenseman, Chase Pilawski, was unable to intercept it. Needham burred the biscuit just 0:24 into the game. There was a brief delay after the goal, not only to pick up the carnations thrown for the HFC promo, but also to fix some loose glass. Shortly after the delay, the Gamblers picked up a holding penalty which lead to a Liam Dennison wrist shot finding it's way through traffic and behind the Gamblers netminder, Maxsim Zhukov, at the 2:03 mark. The goals came on the first two shots on net by the Phantoms. The Gamblers weren't going to fold 'em just yet. On a two-on-two rush up ice, Luke Mylymok laid a pass to the top of the crease where Noah Prokop, who had gotten a step on defenseman Jeppe Urup, was able to tap it in behind Chad Veltri at 7:55. The Gamblers would even it up late. Ben Schoen would get caught backtracking in his own zone, carrying the puck towards Veltri's crease. Prokop would strip him of the puck and lay a pass to Mylymok at the far post to tap in, returning the favor on the first Gamblers goal at 18:55. Shots were 9-8 Phantoms after the first, and the score tied at 2. The only tally of the second frame came at 15:36 off the stick of the former Muskegon/Central Illinois forward Benito Posa. Posa took control of the puck in his own zone with the Phantoms tagging up on a delayed offsides. Posa proceeded to wheel around his own slot and skate pretty much straight up the middle of the ice, splitting a pair of Phantoms defensemen, Jeppe Urup and John Larkin, and sliding it under Veltri as Posa fell, sliding through Veltri and dislodging the net. The Phantoms argued the call, probably for interference and/or the net being knocked off but the puck had crossed the line before either. I sit behind the net and had a perfect view, and I can say with confidence it was a good goal. Shots were 9-5 Phantoms, but the Phantoms found themselves down a goal heading into the third. It would not take the Phantoms long to even it up. Just 0:51 into the third, Trevor Kuntar hit Connor MacEachern with a pass in the high slot for a one-timer that beat Zhukov. At 6:39 Jeppe Urup got his first point as a Phantoms and a little redemption for being on the wrong side of a few Gamblers goals. Jack Malone took control of the puck along the boards and threw a pass to the Danish d-man, who was all alone on the back door tapping his stick for the pass, for the eventual game winner. The Phantoms added an insurance marker on a give and go between Matthew DeMelis and Josh DeLuca with DeMelis finishing it off at 8:55. With a good crowd, 2,434 officially, the Phantoms definitely put on a decent show and came away with a big 2 points. With all 3 teams who are ahead of us in the Eastern Conference standings losing this weekend, Muskegon and Chicago also losing on Friday, the Phantoms tightened the race another notch. A win tonight could mean just 3 points seperate us from the 2nd place spot and a first round break in the playoffs. However, that's a discussion for another day. And here's the highlights! Craig Needham scores just 24 seconds into the game! Jeppe Urup gives the Phantoms the lead! Matthew DeMelis and Josh DeLuca hook up for a goal!